Having read Guillermo del Toro and Chuck Hogan's books, I was a fan before The Strain was announced as a TV show. As casting came together and I learned that Del Toro/Hogan wrote the pilot and would be involved, I knew FX had a hit on its hands. That said, The Strain Season 1 Episode 1 far exceeded even my expectations. This is a cinematic experience, with vibrant hyper-real colors, a brilliant score and an outstanding cast. Since I'm obviously a fan, you will notice I won't generally "critique" the episodes. I'd much rather theorize, ask questions and engage with other fans. It's my hope you guys hit the comments so we can share a weekly discussion about The Strain here at TV Fanatic. As Regis Air flight 753 approaches JFK, not only do we meet a few of the survivors, but we get a peek at our big bad. This monster gives new meaning to the term "big bad," doesn't he? He's absolutely enormous, those poor passengers never stood a chance. So... who are our survivors? We have Gabriel Bolivar, a world famous rock star. The fact that he has thousands of adoring fans makes him an ideal candidate for spreading the infection. There's Joan Luss, an attorney, who may come in handy later on. Ansel Barbour is a father and husband in denial about his condition. Finally, the pilot, Capt. Redfern who is the first person to reanimate and scare the hell out of Nora. The little girl is Emma Arnot (Isabelle Nélisse also plays a creepy little girl in Mama), and she's not a survivor like the others but she is up and walking around. That's got to count for something no? Once the tower figures out this plane is completely dead on the runway, every agency and their mother is called in. The most important being the CDC, led by epidemiologist Ephraim Goodweather (Corey Stoll from House of Cards). While The Walking Dead bored many fans to death last season attempting to flesh out its characters, The Strain does that from the get–go. By introducing Eph's family and his marital issues, we quickly understand he's a work comes first kind of guy. Though it's also clear he loves his son Zack (Ben Hyland also played Stoll's son on the first season of House of Cards). Personally, I think Stoll is super likeable in this role and definitely a strong lead to carry the series. I think it's safe to say Eph has flunked his marriage and though Kelly (the lovely Natalie Brown from Being Human and Bitten) still seems to love him, she's ready to move on. Will they get joint custody of Zack? At JFK Airport we meet Nora Martinez (Mia Maestro of Alias and The Twilight Saga: Breaking Dawn Parts 1 & 2) and we learn their relationship started way after Eph and Kelly's separation. This was not an affair folks, our hero is one of the good guys. He's just married to his work, so I guess it helps Nora's into germs too. Ha! Homeland Security wants to board the plane assuming this is a terrorist threat, but Eph explains a virus exists only to find a carrier and reproduce. If there is a contagion aboard, this can lead to an all out plague. Needless to say, they back off and let the CDC do their thing. Inside the aircraft all the passengers are dead, 206 souls (there were 4 survivors, remember). The creepy little girl appears to be looking up. Do you think she saw the creature before she died? The UV lights reveal biological patterns and the colors on this show are absolutely amazing by the way. Nora explains the patterns are probably linked to the ammonia in the cabin. What's the deal with the ammonia you think? Eph spots the cargo hatch is open, while Nora gets up close and personal with Capt. Redfern. The survivors I mentioned above start coming to and are soon quarantined. Meanwhile, we're also introduced to Abraham Setrakian (David Bradley, Filch in the Harry Potter films and Walder Frey of the infamous Red Wedding in Game of Thrones). Bradley's manic energy here is very different from his previous roles. Didn't think of him as Filch or Frey once. He's back. I don't know if I have the strength to do it all over again. Permalink: He's back. I don't know if I have the strength to do it all over again. When Setrakian feeds the thing a few drops of blood and says "enjoy dear," we know there's a story there. Who do you think the heart belongs to? Next up, we meet Thomas Eichhorst (Richard Sammel). By the end of the episode we understand this person (or is he something else?) knows Setrakian. The Stoneheart Group is behind all of this. They arranged to have the 9 foot cabinet shipped from Berlin to New York. The old man, Eldritch Palmer (Jonathan Hyde), is not long for this world. Apparently, the old man has struck a deal (and crossed a line as he said) in an effort to live forever. Do you think he knows exactly what's he's involved in? If so, pretty damn selfish of him eh? Eichhorst informs Palmer that the cargo arrived safely. Speaking of the cabinet (or coffin) with the detailed hand carved skeletons, it's fairly obvious with a latch on the inside that something big is on the loose. The airport manager hears a humming and approaches in typical horror movie fashion by himself. Did the creature call out to him? I loved the way The Master moves, he's fast and that stinger shot out in an instant. It was cool to see the little worms drinking the man's blood once the stinger attached itself. If there was any doubt we're dealing with vampires, this scene pretty much clears that up. The effect of sucking the man dry like a juice box was killer. However, I wonder why The Master crushed his skull Game of Thones-style? Did the man not fit into the bigger picture? Isn't the plan to spread The Strain far and wide? Gus Elizalde (Miguel Gomez) wasn't a character I was crazy about in the books, but I enjoy the way Gomez portrays him on the show. He had worked for Eichhorst in the past and was trying to go legit. However, this deal was too good to pass up. By delivering this cargo, his brother's criminal record would be wiped and his mother's immigration status fixed. Besides he was clueless about what he was transporting. Eph's friend Jim Kent (Sean Astin) on the other hand, should have known better. Was he aware the coffin was in that van? Or did he simply see the Stoneheart Group's logo and allow the van to pass? Is Samwise Gamgee a villain and in league with The Master? Or is there more to his story? Speaking of Eph, dealing with the passengers family during that press conference circus was a total nightmare. At least he was honest, explaining the passengers are dead and only 4 survived but they don't know why. The dead little girl's father slapping him was uncalled for. He was doing his best. Tell me the chief medical examiner didn't smell like a goner when Eph asks him to work alone to avoid leaks to the press. The small incision found on the victims necks is apparently the cause of death but how exactly did The Master manage that? The corpses white blood and seeing the worms slithering beneath the skin under the UV light was a great effect. The bodies are going through a metamorphosis, shedding organs they don't need and making room for the giant stinger. How freaky was it watching those corpses reanimate behind the medical examiner. Poor guy. It's going to be great watching the survivors change over the course of the next few episodes right? I like that we get to see their stories as well. Inside the plane's cargo compartment Eph and Nora discover the worms. At least they know this thing isn't airborne. Jim lies and tells Eph there's no sign of the coffin. When Jim asks about the worms, Eph calls them "something new." Do you think Jim realized at this point what a terrible thing he's done? Love is going to guide them all back. To their homes. To their loved ones. Permalink: Love is going to guide them all back. To their homes. To their loved ones. How frakkin' creepy is that? These creatures appear to be zombies, however they are not mindless monsters. They have some form of consciousness and will be seeking out their loved ones to spread the disease. Insane right? Del Toro is one twisted dude and I, for one, love him for it. When Emma, the dead little girl, returns home we see her eyes blink like Eichhorst's did. Will the creatures evolve until they resemble a human being again? Or is Eichhorst a special case as he is the Master's chief lieutenant? 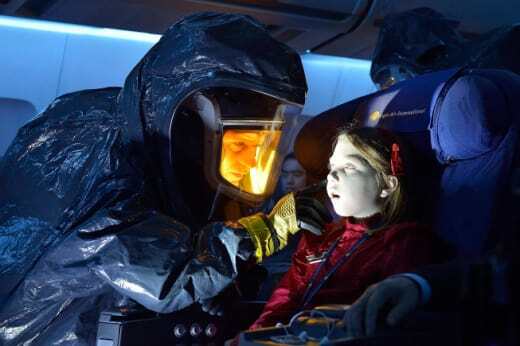 What did you think of The Strain premiere? Are you in for the season?